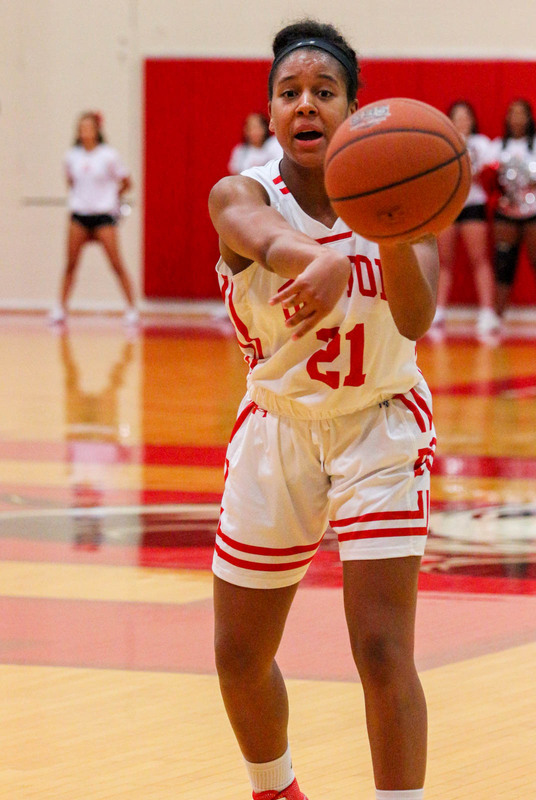 The Boston University women’s basketball team traveled to Hanover, New Hampshire, Wednesday for a matinee showdown with Ivy League opponent Dartmouth College that ended with the Terriers (4-3) leaving empty handed as they fell 64-44. The BU offense was shut down by the Big Green (3-4) defense in front of a raucous School Day crowd at Leede Arena. The Terriers were also missing their leading scorer. Junior forward Nia Irving, who has an average of 13.7 points per game, did not play due to a wrist injury and will miss the next three games, according to BU head coach Marisa Moseley. Moseley said the team will have to persevere without the star junior. Both teams exchanged buckets to open the game, but Dartmouth was able to jump out to an early lead halfway through the first quarter 11-5 due to a 6-0 run. The Big Green continued to take shots from all around the court as they led the Terriers 20-15 at the end of the first period. Dartmouth took 20 shots in the quarter, making eight of them, compared to BU’s 6-for-11 mark. The Terriers briefly tied the game at 20-20 early in the second quarter following a layup from senior forward Naiyah Thompson, but Dartmouth crashed the glass, out-rebounding BU 23-to-13 in the first half, including a stunning 10 offensive rebounds. Dartmouth ended the quarter with an eight-point lead at the half, 34-26. Both squads were ice cold from beyond the arc in the first half, as both teams shot below 30 percent from three. Big Green senior Isalys Quinones’s first half saw 13 points and four offensive rebounds. For the Terriers, senior guard Lauren Spearman and freshman forward Riley Childs led the Terriers with six points at the break. Dartmouth came out firing in the second half, building the lead up to 12 after finding its touch and making two out of three shots from the three-point range. On the opposing side, BU failed to convert on any of its three-point attempts through the middle two quarters and fell to a 42-30 deficit. BU shot at 31.5 percent from the floor and made only four three-point shots in the game, compared to Dartmouth’s 40.0 percent shooting and seven threes. The Terriers battled back to end the third quarter and cut the deficit back down to eight at 47-39 as Childs led the Terriers and put up eight points in the third frame. Moseley said that Childs’ performance in her first collegiate start was impressive. Dartmouth opened the fourth quarter with a flurry of baskets and continued a 8-0 run from the end of the third quarter to open its then-largest lead of the game at 16 by two minutes into the final stanza. The Big Green kept the pedal to the metal and continued to pound the ball inside the paint, jumping out to a 20-point lead final score of 64-44 as Dartmouth held BU offense to 44 points despite the Terriers averaging 63.2 points a game entering Wednesday. The win snapped a four-game losing skid — all on a West Coast road trip — for the Big Green as Quinones led in scoring with 15 points and seven rebounds while Childs had a game-high 17 points for BU, also collecting three rebounds. Freshman forward Chiara Tibbitt put up seven points in her first collegiate start as well. The Terriers have a week off to prepare for a three-game Bay State road trip starting with the University of Massachusetts on Wednesday. UMass (5-4) will have a chance to break a two-game losing streak at home Friday against the University of the Incarnate Word, which became a Division I program with full rights last season. Moseley said that the team will emphasize defense in order to prepare for facing UMass.